Late last year, the International Fund for Ireland welcomed the fifth annual Forum for Cities in Transition (FCT) to Belfast for a series of discussion on the theme of “promoting reconciliation through resilience”. 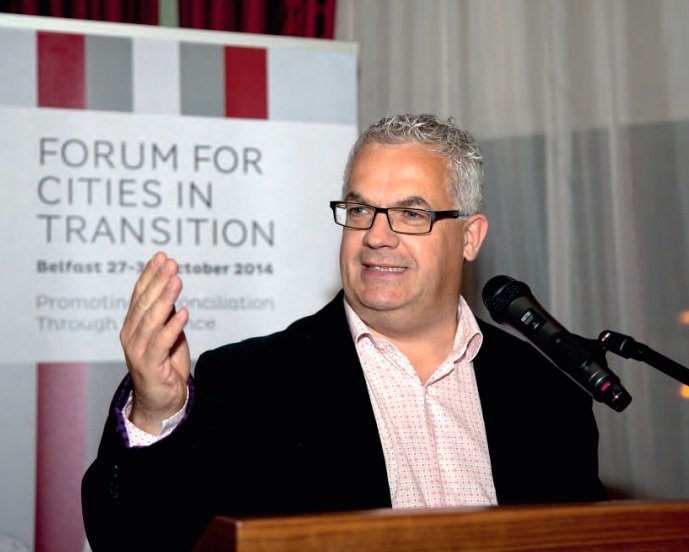 The Chair of FCT Belfast, Councillor Tim Attwood, shares his experiences from the event. The simple concept behind the FCT is a philosophy of peace building and reconciliation that is the life work of energetic Professor Padraig O’Malley, from the University of Massachusetts, Boston. Padraig has worked for peace in the North of Ireland, South Africa, the Middle East and Iraq. The core idea of FCT is that divided cities have much to learn from each other. Divided cities can share patterns as well as political, social and characteristics that may lengthen conflict. The best way to overcome these patterns and characteristics is through a constructive dialogue by those who have experienced them and have learned how to break the cycle of violence. Over the week delegates from Baghdad, Kirkuk, Jerusalem, Tripoli, Mitrovica and Kaduna in northern Nigeria, spoke powerfully about the impact of conflict on their cities. It is so easy to despair over many of the conflicts such as the insurgency by the brutal Islamist group Boko Haram in Nigeria which has killed thousands of people and kidnapped 200 school girls over a year ago. Yes, so easy to despair, were it not for the remarkable example of Christian Pastor James Wuye and Muslim Imam Muhammad Ashafa. In the 1990s, these two men led opposing, armed militias dedicated to defending their respective communities as violence broke out in Kaduna, northern Nigeria. In pitched battles, Pastor James lost his hand and Imam Ashafa’s spiritual mentor and two close relatives were killed. In a true spirit of forgiveness and reconciliation Pastor James and Iman Ashafa joined together to establish the Muslim-Christian Interfaith Mediation Centre in Kaduna, which now plays a leading role in resolving conflicts across Nigeria, including talking to Boko Haram. Every day, it was uplifting to listen to their stories and immense personal acts of peace building in the face of adversity. It was important to hear the voices of the forgotten victims and the unaddressed legacy of the past. It was important for delegates to witness the consequences of the 40 long years of conflict which took a terrible toll, too many people died, too many families grieved and every family was denied the quiet blessings of a normal life. Delegates heard about the challenges of building a shared space and maintaining the peace in divided communities. At the IFI funded Suffolk and Lenadoon Interface Group , delegates listened to the personal journey of two champions of peace in Jean Brown and Renee Crawford who have done incredible cross community work in the area. Delegates also visited the WAVE project to listen to the emotional and traumatic journeys of victims and survivors such as Paul Gallagher, paralysed by loyalist gunmen in 1994 and Alan McBride, who lost his wife Sharon in the Shankill bombing and their collective efforts to support victims and seek justice and truth. One of those listening was Amir Kulaglic, a survivor of the Srebrenica massacre in July 1995, where more than 8,000 boys and men between the ages of 14 and 75 were murdered. He lost his father, his step-father, two uncles, two cousins, his brother-in-law and his father-in-law. Despite his wrenching pain, he is an independent activist who speaks out for the victims of Srebrenica. He said many victims have never been found and the perpetrators not only walk free, but have active roles in the city government. Peace & Conflict Resolution/Transformation is one of the major areas of focus of Rotary International.